Syeeda S. Amin | Littler Mendelson P.C. Before attending law school, Syeeda S. Amin was a chemical engineer for a Fortune 100 company, and she now applies her mathematical background to assist clients with computational aspects of employment law. As a member of Littler Mendelson's Class Action Practice Group, she conducts damage calculations for nationwide class actions, with special emphasis on wage and hour class actions, and coordinates statistical analyses to assess clients' hiring, promotion, termination and pay practices. Her scope of knowledge also includes the Fair Labor Standards Act and the Older Workers Benefit Protection Act. 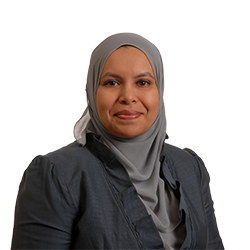 Syeeda is a member of the firm's Business Restructuring Practice Group, counseling clients undergoing reductions-in-force, and serves as member of the Diversity and Inclusion Council. In law school, Syeeda was associate managing editor of the International Law Review Association.